“The average cruiser gains 1-2 lbs a day”. This was a pretty big deal for us, and it got us a little worried. We are on this ship for 12 days, and we do NOT intend to gain 12-24 lbs in less than two weeks! Naturally we were a bit skeptical of this, but after seeing the buffet, we started to understand how that could easily become a reality. There is such a wide spread of food on-board, we found ourselves filling our plates full every time. Assorted meats, pastas, curries, exotic fruits, cheeses and breads, stir-frys, pancakes… you name it. Every five steps was a new container of delicious food, and that’s BEFORE dessert! It’s no wonder people gain weight; the eyes-to-stomach-size ratio wasn’t congruent at all. You don’t leave the table satisfied, you leave it stuffed! The calorie intake on a cruise is massive! Plus, the luxury and ease of everything on-board makes it easy to take advantage of relaxing and never having to work hard for anything. The ship caters to your every need, the staff and crew are always there to tend to your every desire, and the amount of entertainment on-board ensures that you will never be bored. 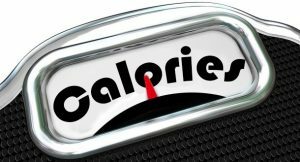 All of a sudden it is quite clear to us how all of these luxuries can impact your waistline and overwhelm you with ‘pampering’. We want to get stronger, more muscular, more defined, a little leaner, and more skilled. And by George, that is what we are going to do! 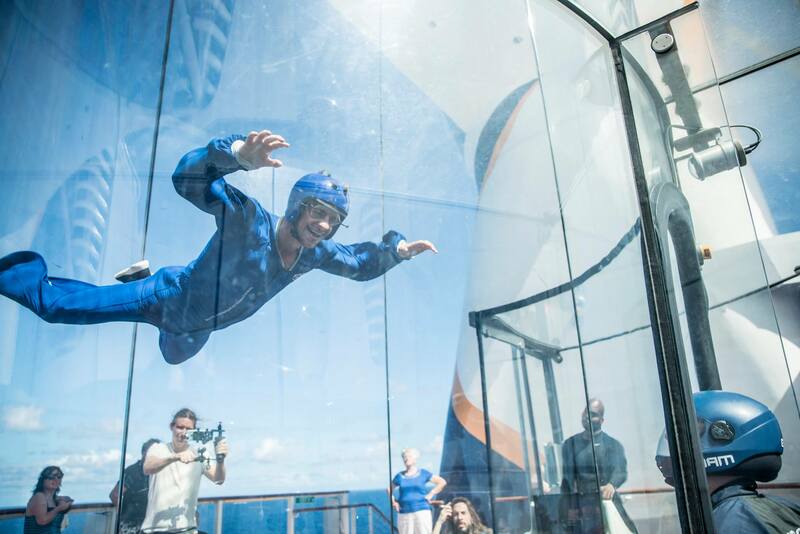 So we took a new approach to the luxuries on-board the Royal Caribbean. 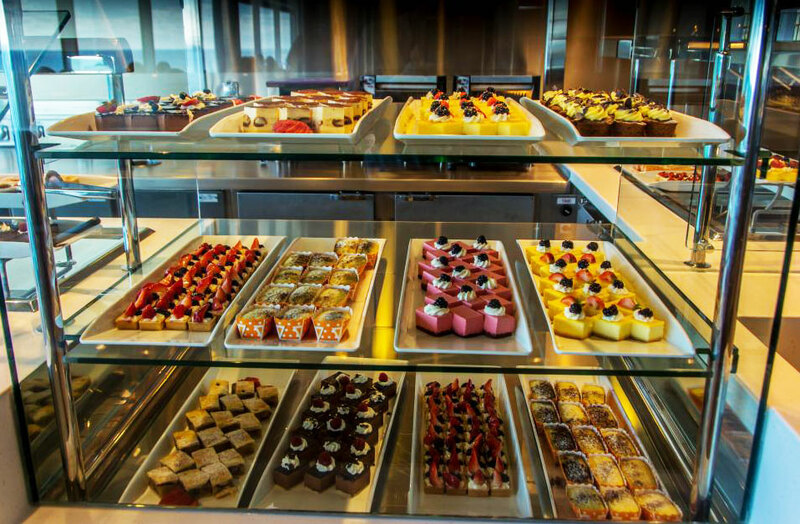 We made it a goal to neglect all sugars and pastries, to reduce our overeating, and to take full advantage of the amenities that were offered to us on-board. For starters, we hit the gym almost every day. Being on this cruise meant we each had a membership, why not use it? 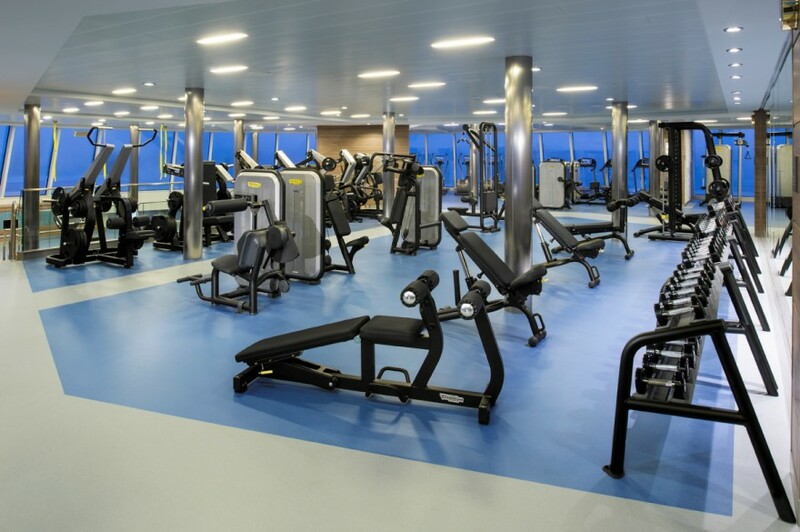 This large fitness center on the top floor was open 24 hours a day, and we had no excuse not to frequent it. The machines were new, clean, and in great condition. Side note: We also realized that if you’re only going up/down a few decks, the stairs are a faster and healthier option to travel than the elevators. 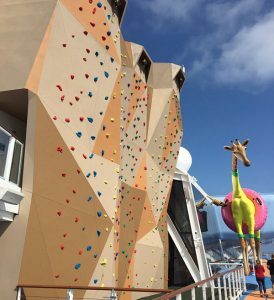 We went and checked out the rock climbing wall one day. We started off just playing around on it casually, until we started to get the hang of it. Then, with the guidance and advice of the instructor, we started to challenge ourselves. Being the competitive males we are, we made a game out of it and started racing up the wall, trying to beat each other’s best times. That was probably the most effective way to improve: challenge ourselves. From the first climb to the last, we had all doubled our speed, and wrecked havoc on our forearm muscles. We had a couple sessions in the wind tunnel, learning how to fly (emphasis on ‘learning’). If you’re never tried it before, it’s surprisingly tricky. You don’t just jump in like Superman and expect to stay in the center. There is a lot to learn and it takes a lot of practice. But it’s incredibly fun! So we went over all the different lessons with the instructor, and practiced drill after drill until we were comfortable controlling our movements by ourselves and even performing some basic tricks. We found a little bit of free time to play in the SeaPlex. The SeaPlex was like a big gymnasium, but with a whole bunch of other games along the outskirts. We redeveloped our basketball skills on the court, we had a brief soccer match, we played ping pong, air hockey, heck, we even got in a little bit of Xbox in. At certain times during the cruise, they would set up a trapeze lesson in there, so we all got to learn how to swing from a bar and backflip off into the crash mats (Let’s be honest, we could already do that but this time, we did it with ‘proper guidance’). 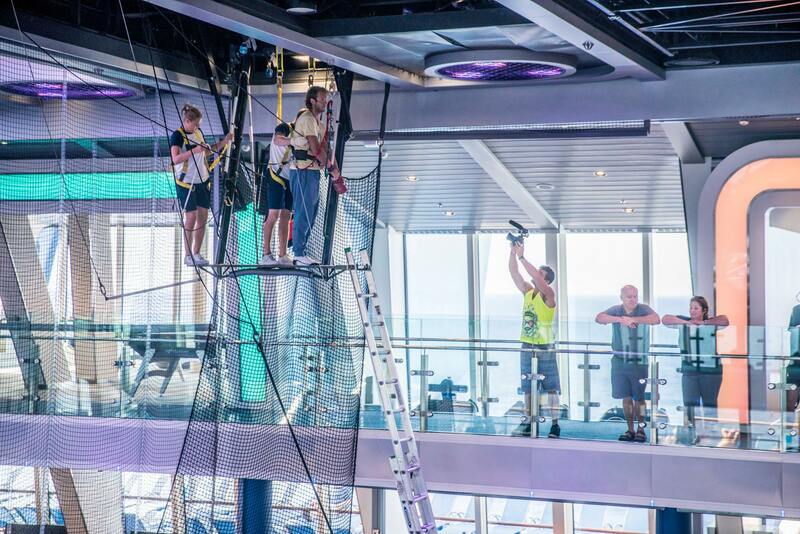 These aren’t skills that you can practice anywhere, but you could on the Royal Caribbean’s Anthem of the Seas. 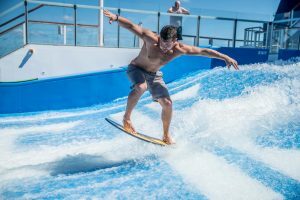 This was easily our personal favourite activity on-board: the FlowRider surf machine. We weren’t very adept to surfing before this trip (having only surfed a handful of times each), but we got back on that FlowRider almost every day and kept training as long as our schedules would permit. We all got the same amount of time on it and all seemed to improve at the same rate. Day by day we were seeing more improvement. So much, in fact, that by the end of the cruise, we were rivaling the abilities of some of the instructors. This was an activity we truly wanted to improve at, so we made it a goal of ours to keep on practicing. 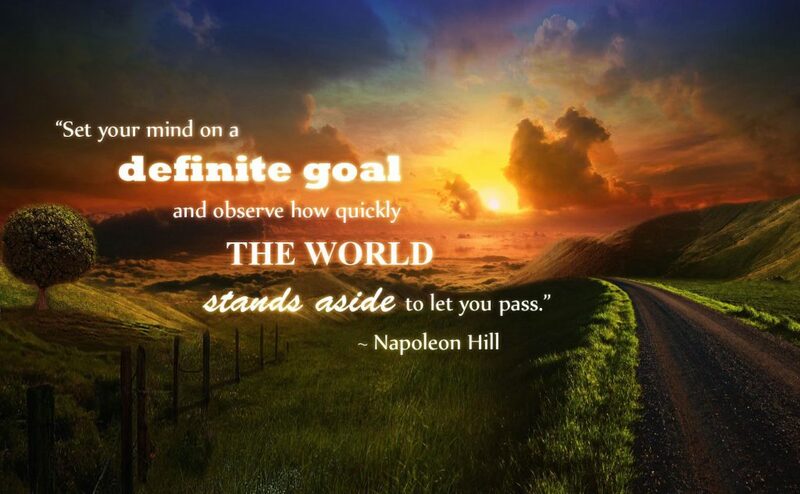 When your mind is set on something, nothing can stop you. There are a few ways you can treat your experience on the ship: like a relaxing vacation where you get to eat anything you want and get pampered the whole time, or you can eat consciously and take part in every physical activity available until you improve your own skill set to a new level. Which kind of experience would you prefer? 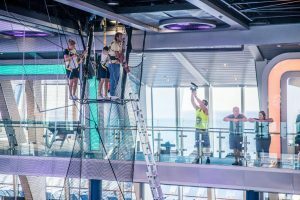 Watch our second episode of our cruise aboard the Anthem of the Seas.